Did you know that 95% of CSP policies can easily be bypassed? This shocking revelation came from research done by Google, and the culprit are overly optimistic whitelists. That’s the bad news. The good news is that CSP Level 3 comes with a new way of dynamically loading scripts, which fixes these problems, and makes CSP a lot easier to use! Find out what it all means in this article. Content Security Policy is a new browser-based security mechanism, which evolves very quickly. Ever since CSP Level 3 started supporting trust propagation, I’ve been following the story closely, and have even talked about the awesomeness of it to a room full of Angular developers, with great feedback afterwards. Of course, I will keep reporting on new developments when they appear, either in additional blog posts or by adding them to the websec digest. If you have subscribed to yet, go ahead and do that now! Unfortunately, it seems that all the effort you put into carefully constructing your whitelist was a waste of time. Last summer, research from Google revealed that 95% of CSP policies currently in place were trivial to bypass. The reason? Insecure whitelists! And not just those whitelists that simply allow scripts from everywhere, but whitelists built by people that understand security and CSP. In fact, the whitelist that this website used, as shown above, is vulnerable to a bypass attack. I know, shame on me! Most CSP policies are trivial to bypass. Have you checked your policy lately? So how is this possible? Let’s see what Google’s CSP Evaluator has to say about the policy shown above. It turns out that by whitelisting Twitter’s CDNs for the widget, we actually whitelist a lot of other content to be included. This content may include JSONP endpoints, meaning that an attacker would be able to inject a script tag that loads such a resource, where the actual callback code is under control of the attacker. A similar problem exists when you are able to load a whitelisted Angular library from a CDN, as that can be used to render innocent-looking text into executable script. I’m not going into all the details of these bypasses here. If you are interested in learning more about these bypass attacks, take a look at the slides or video of the original AppSec EU talk covering this work. As most whitelists can be bypassed, you might think that CSP is broken beyond repair. But that’s not true. There are two concrete things you can do to fix the problems with whitelists. The first solution is to actually whitelist up to the file level. If you only whitelist explicit script files on a CDN, there’s no way to include potentially dangerous scripts, such as an Angular library of a script coming from a JSONP endpoint. There is however one caveat: in most scenarios, whitelisting explicit files is next to impossible to get right, and to maintain. Wow, if that’s all you need, strict-dynamic must be magical! It’s not, but it is pretty awesome. Let’s break down what the policy above actually means. The first part defines a nonce that can be used to include inline and remote scripts. This is part of the CSP Level 2 specification, and has been around for quite some time. In case you need a refresher, the nonce in the policy must match a nonce defined on a script block or remote script, and must be freshly generated for each page. This allows you to whitelist scripts you have put in the page yourself, but prevents an injected script from being executed, as shown below. That code will load additional files from Twitter, behavior you actually trust as well (since you have put this in your page). Normally, you would have needed to whitelist these files, but with strict-dynamic, the browser propagates trust and simply loads the file. The newly loaded Twitter script needs to load even more resources (Hey, welcome to the web! ), which would again need to be whitelisted. But just as before, the browser allows this to happen, because of strict-dynamic. And this is the true beauty of strict-dynamic, it simply propagates trust that was already there. If you still need to be convinced, take a minute to actually think this through. Before CSP, the code would have been able to do whatever it wanted. With CSP, you would have whitelisted the code anyway (see the original policy of this website), even though you did not really know what it does. So while strict-dynamic seems like an enormous leap of faith, it simply applies the same implicit process you used before. CSP's new 'strict-dynamic' makes me want to give it a try! A final word about strict-dynamic: It only works for non-parser-inserted scripts. This means that it only works for script elements that are being added to the page by using DOM APIs, not by triggering the parser (e.g. through innerHTML). This is to ensure that the developer actually intended to add script elements to the page, instead of becoming the victim of an injection attack through a text-to-code sink. For more information about the reasoning behind strict-dynamic, I can highly recommend the AppSec EU talk, where strict-dynamic was first introduced to the world (slides, video). That can’t be right, it includes unsafe-inline, and whitelists all http and https resources!!! Well yes …, but it kind of depends on the browser. And it’s only there for backwards compatibility, not for security. But it’s a mess. Take a look at the picture below, which should clarify things a bit. The universal CSP policy only offers decent protection on modern browsers, but does not break anything on older browsers. The nonce will be ignored, but unsafe-inline ensures that everything keeps working. Obviously, there is no protection against injected script blocks. Google deploys CSP with strict-dynamic for a lot of its services. As mentioned in the introduction, I have updated the policy of this site to use strict-dynamic. During that update, I actually followed the advice of the CSP Evaluator, and set object-src to none. The main reason to do so, is that this site does not use plugins such as Flash and Java. However, from inspecting the reports, it became apparent that this was also blocking Chrome’s built-in PDF viewer, even for displaying full-page PDFs. While this may seem weird, it’s actually the way its documented in the HTML spec. What really happens when you open a PDF is that Chrome creates a new HTML page, inserts an embed tag to load the PDF, and renders that page. In doing so, it applies the CSP policy that is being served with the PDF, which caused the viewer to be blocked. report-uri.io allowed me to detect the blocking of PDF files. When I tweeted about this problem, it turned out almost nobody knew about this kind of behavior. Thanks to Mike West’s quick response, it has now been explicitly mentioned in the CSP spec, which will hopefully help other people detect and fix this problem as well. The former is obviously more restrictive than the second approach, and it protects you better against content sniffing attacks (where the browser misinterprets a content type, resulting in an XSS attack vector). For now, I have opted to go with the second approach, and have added the directive shown below to the CSP policy of this site. The main reasoning behind this decision is that the site consists of static content only, and that I control all of the content. 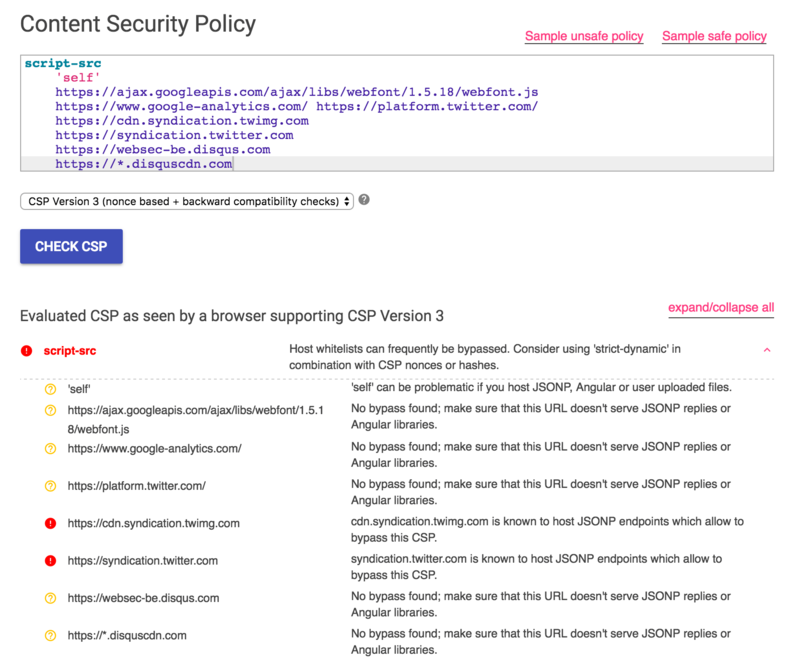 If you take a look at the CSP policy below, which is the policy currently deployed for this site, you will see a lot of hashes in there, but no nonces. This is a statically generated site, meaning that it would be hard to include a freshly generated nonce in every response from the server. Attendees for my training courses have asked me similar questions for sites running on static hosting solutions, such as Amazon S3. Because the CSP policy contains the hash of this inline script block, the browser marks it as trusted, and actually allows the script to load additional files through strict-dynamic. While this may result in a small performance penalty, it allows me to deploy CSP to protect you against injection attacks! Where you vulnerable to these CSP bypass attacks? Or will strict-dynamic help you adopt CSP in your applications? Let me know in the comments below! « Are we losing the battle for a secure web?